HELL IS EMPTY AND ALL THE DEVILS ARE HERE. Shakespeare wrote that over 600 years ago, and if you listen to the news, you’d believe it’s as true today as it was in The Tempest. But I believe, while Hell may be empty, Heaven is also empty, and all the angels are here too. In fact, I believe Heaven is here on earth. You just gotta look a little harder, travel a little further and turn off all the sound and fury to find it. Going to The Maritimes last month was that for me. Everything was dead for the winter, nobody was around and the weather was absolutely miserable. But quietly wandering along the Bay of Fundy and witnessing the largest tidal shifts in the world, well, that's the closest to church I get. Every 6 hours the tides rise and fall over 46 feet. 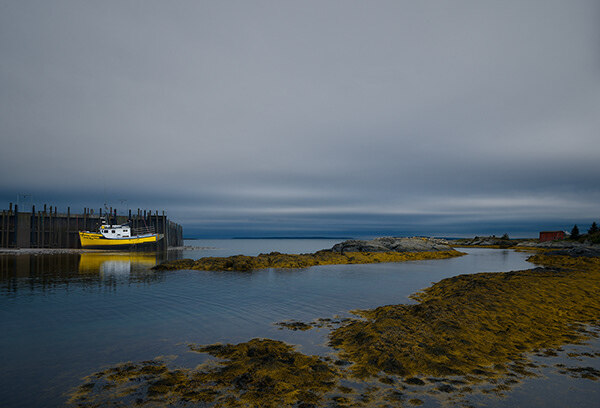 So at low tide all the lobster boats are sitting on the ocean floor, and the landscape looks other-worldly. What a wonder. Bay of Funday, New Brunswick, CA.